Christmas 2009 is in the history books. It is but a memory. Most things were great, as they should be. 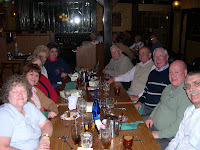 The "Out With Friends" dinner group has had their first dinner of 2010. It was a grand progressive dinner that started at 5PM and ended at midnight after one course each of a five course meal at five different homes of members. A sixth couple is already in Florida for the winter. A drawing was had to decide which of six months each couple would determine where we would eat in 2010. Julie and I drew September. The Murphy's drew February and already have the restaurant picked out. The group also decided to do a Dinner-Dance Cruise on Lake Erie in August. 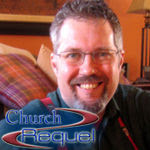 Among the many conversations of the season was my report on the wonderful Christian spirit shown in the giving of gifts to the less fortunate by Church Requel where my son Mark is the Senior Pastor. Trying to answer questioning of the agressive growth of this new church, as compared to that of our own church, which was founded in 1877, the response was the same that I often receive when describing spending a month at the beach or a trip to Ireland: It Must Be Nice! The response to Church Requel kicking off the start up of their new church with ten bill boards of advertising around the city, reinforced with radio, television and newspapers, was to question the source of the funding. When told that among other sources was the fact that the pastor worked VERY HARD, along with his leaders, for nine months without pay while using their own personal funds, the attitude was That will never happen here! Incidentally, Does Church Requel BEG for money? NO! The fact of the matter is the church does not even take up an offering! 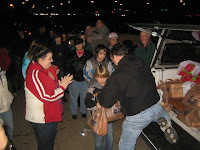 It is with pure delight that I share with you pictures of Church Requel's Christmas Giving to the Less Fortunate. The church leaders use the first 10% of income to help those less fortunate. 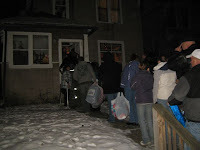 When the call came for workers to distribute gifts Christmas Eve, from the 75 or so in attendance, 29 showed up to do the work. 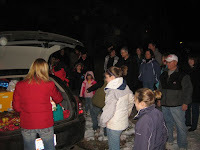 They divided into four groups to deliver their gifts to four families identified by the Salvation Army as being in dire need. 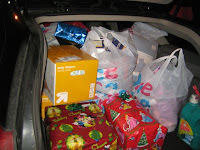 Two thousand dollars of food, clothing, toys and other needy items were given along with cheerful singing and well wishing. When the recipients looked out to see who was at their doors this Christmas Eve, they were thrilled to see a long line of "Santa's Helpers" laden down with all the Christmas Cheer they had painfully known their family would do without this bleak year. One family didn't even have a table at which to eat. 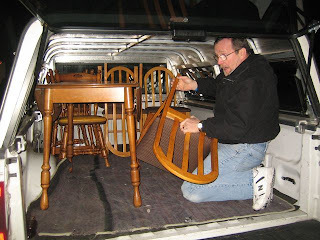 A kind Church Requel couple thoughtfully refinished their own spare table and chairs to make Christmas dinner a special blessing for this needy family. "When you do to unto the least" scripture comes to mind as I reflect upon how God shall, or has, richly blessed this couple who gave so freely of what they had. "IT MUST BE NICE" & "I WONDER HOW THEY GET THE MONEY"
Be nice, now Walt, be nice! Love it! Especially the "be nice" comment at the end. I personally prefer honest to nice....wonder where I got that trait?!? Wow! That was a great article. Of course I WOULD think so. :) I'll share this with my own readers and congregation. And when one of them comments to me about having such a supportive father: "It must be nice," I nod and simply agree. Love you Dad!